Rusk County Amateur Radio Club: Are QSL cards waiting on you? 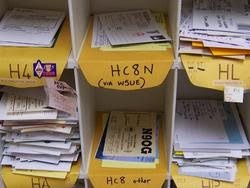 Are hams from exotic countries trying to send you a QSL card? Is there a pile of cards just waiting to be sent to your station? The ARRL's incoming QSL Bureau is free of charge, but unless you've send a SASE or money to pay for postage, your cards may be waiting on a self, delayed from making that final leg of the trip to you. It used to be that the only way you would know was if you sent a SASE to the bureau. Then you waited. Or maybe you got lucky and a generous QSL sorter dropped you a postcard to let you know cards were on file for you. Now, however, the answer may be just a mouse click away! If your callsign contains a five, the person responsible for sorting your cards has posted his or her database online. It's waiting to searched right now! Search it from our own Operating Page or click through to the Bureau's website and search from there. Good luck!